Nigerian playwright and political activist Wole Soyinka, the first African to win a Nobel Prize for Literature, has had to fend off fans who mistake him for the American actor Morgan Freeman and former United Nations Secretary-General Kofi Annan. He admits to feeling "burdened by expectations" that the Nobel laureate label carries. "With a head of hair like this, you get spotted from a distance. It can be a nuisance. I see people coming this way, I go the other way... I've been pursued for autographs in France as Morgan Freeman before," the 81-year-old tells Life during an 30-minute interview at the Mandarin Orchard hotel. With some resemblance between the two, one can see how Freeman, who has played the former South African president and anti- apartheid activist Nelson Mandela in the 2009 film Invictus, would slip comfortably into a biopic about Soyinka. Tall and sagely, with an untamed crop of snow-white hair, Soyinka speaks with a quiet authority, in a crisp, sonorous Nigerian-British accent that hints at a life spent shuttling between his homeland and its former colonial master. I consider it a pustule in the social body. It is totally venomous. I consider movements like that ahuman aberration. The writer and poet first began his literary career in 1960, when he put on satirical plays that incorporated beliefs of his Yoruba ethnic tribe. Since then, he has produced a steady stream of plays, poems, critical essays, books and memoirs in a career stretching over 55 years. Jailed for 22 months in 1967 for conspiring with rebels, he spent his time in incarceration writing a diary and poems, later published in the poetry collection A Shuttle In The Crypt. After he fled the country in 1994 for the United States, he was sentenced to death "in absentia" by the military ruler General Sani Abacha in 1997. In his later years, his output has tilted towards political commentary and criticism. One of his most recent works, Of Africa, published in 2012 by Yale University Press, explores the continent's past and present, and what it has to offer. Soyinka, who is married to his third wife Folake Doherty, now lives in his hometown of Abeokuta in south-west Nigeria, but still travels regularly to give talks and workshops abroad. The overseas fellow at Harvard's Hutchins Center for African and African- American Research takes an active interest in Nigerian politics. "I think I'm a secret masochist. Sometimes I do things I shouldn't be doing, like with fulfilling all these engagements. I look at my own calendar and say, 'How could I be so careless?'" he says. He was in town for a public lecture this past Friday titled Playing Footsy With Terror, held at the Nanyang Technological University. It is part of the Nobel Prize Series, produced by Nobel Media and the Nobel Museum in partnership with the university, with The Straits Times as official media partner. Explaining the provocative title of his talk, Soyinka says: "It's about how terror affects education in Nigeria, and in general. I put terror and extremism on the same level as diseases. People contract them across borders. Someone reads about an event somewhere and thinks he can do better." On the topic of Boko Haram, the extremist Islamic insurgent group in Nigeria infamous for abducting and massacring civilians, his response is sharp, each word ringing with ferocity: "I consider it a pustule in the social body. It is totally venomous. I consider movements like that a human aberration. It has to be extirpated from the body polity." He also takes issue with the label "emerging economy", often used to describe up-and-coming African countries. "I find this word troubling. Countries borrow. The national debt of many 'emerged' nations is heavier than that of these 'emerging' countries. So what yardstick is used for emerging? I don't understand." Despite his political activism, literature remains a topic close to his heart, even as he refuses to disclose what new projects he is working on. In recent years, Nigeria has seen a new wave of writers such as Chimamanda Ngozi-Adichie, Chigozie Obioma and Teju Cole winning acclaim on the international literary scene. Of this, he says: "When you look at the art, and it's particularly noticeable in literature, you're astonished by the explosion of talent, especially the young female generation of writers. It's a curious phenomenon, like the post- independence wave. I suppose it happens in the artistic life of many nations." But while Soyinka is crystal-clear on certain issues, he can be frustratingly hard to pin down on other matters. He brushes aside requests for a photo shoot ("I don't like cameras. Photograph me as I speak."). Moments before wrapping up the interview and striding out of the hotel, he says of his role representing Nigeria on the world stage: "I don't see any special role for me. I just follow my occupation, which is writing. I don't set out to inspire anyone. I don't see myself as a kind of ambassador." 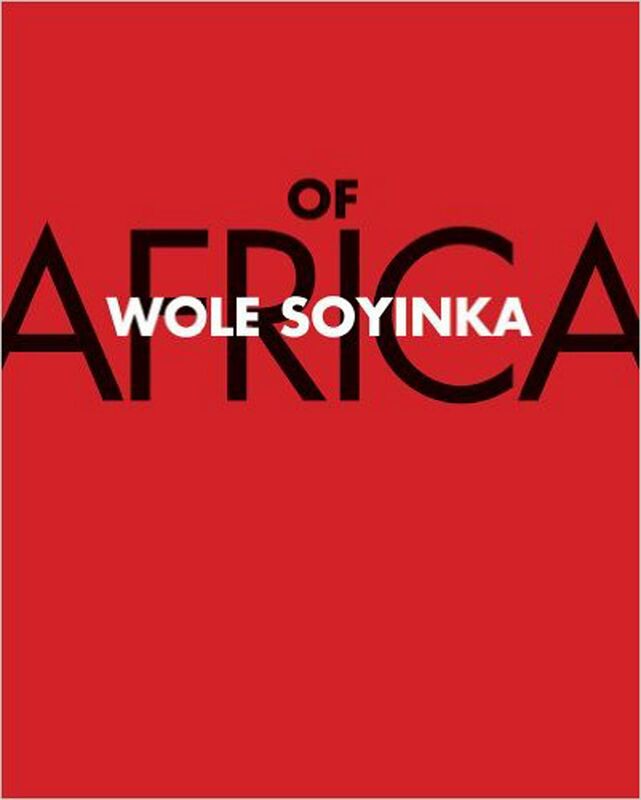 • Of Africa by Wole Soyinka retails at $25.68 at Books Kinokuniya.